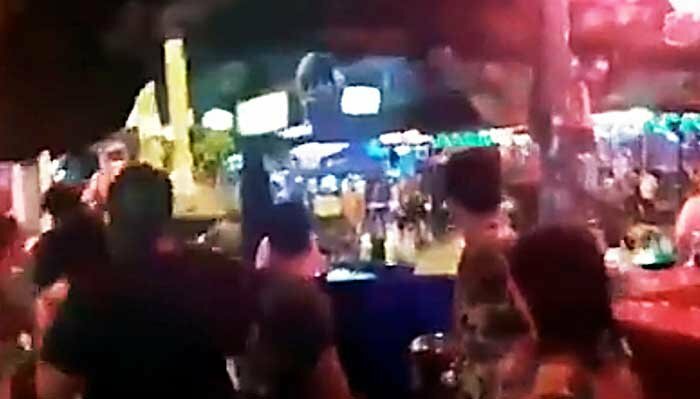 The Pattaya News reported that Thai and foreign tourists ran for cover as a group of 50 young Thai people fought and threw things in the Soi 7 and 8 Beer Bar areas. In a video people could be heard shouting that the police were coming and there were further cries of "chuay duay" (Help!). The tourists were worried about being hit by stray objects. The media said this all occurred at about 6 pm on Monday. The police made a few arrests but most of the melee miscreants melted into the crowds. Pattaya celebrates Songkran longer than everywhere else - the water wars are expected to continue until Friday. Looks like a good time, said who? I remember on another post yesterday, one poster R==M--- defending Songkran in Pattaya, saying it was a great bit of Thai culture, real fun, and less boring than the western 'New Year' fireworks displays ! I'll stick with the pyrotechnics thanks Rob. Just a few skinny young teenagers. Boys will be boys. Credit to the cops who were there and had the situation under control in less than minutes keeping everyone happy and safe. good guys out, bad guys out, all guys out. New Year celebrations in most countries that use alcohol usually involve a bit of violence. 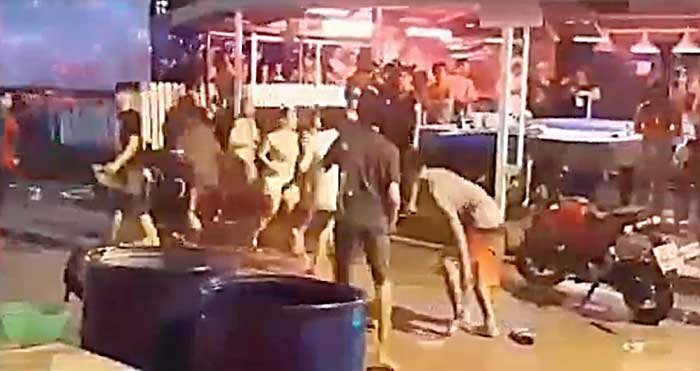 Songkran Pattaya brings drunks from around the world night after night and the violence per liter of alcohol consumed would be very low. The Thais who work in these areas have a very high tolerance for drunken idiots and credit to them. 500,000 people celebrating and the only incident is with a group of 15 year old boys. Nothing much in this at all except for a squeaking bar girl. i was down there last night and everyone was happily enjoying the festivities. It reminded me of the Summer of Love. It'll be worst on the 19th..normally the real guns (not water pistols) come out to play on that day. Boys will be boys, until someone gets killed. Just young hooligans taking advantage of the 'celebrations', such as they are in that dump of a place. At 2:30 is that music or someone’s car alarm going off? Shhhh you can't say nasty things about Pattaya....its just clean family fun! The problem with the pyrotechnic on NYE is a lot of the strays dogs freak out and dash onto the road into oncoming vehicles, some just ran for their lives and lost their way back to their usual hunts. I much rather have some water wars at least then if humans wanna fight and kill each other let them.